The second major phase of the DSCSA will not occur until November 27, 2023 when the law transforms into something that is fairly nebulous right now. That is, between now and 2020 the DSCSA requires the FDA to work with the industry and other stakeholders to define exactly how that phase will work. But we do know that, whatever that effort determines, it will require every company to document exactly which unit-level and/or homogeneous case-level serial numbers were involved in each supply chain transaction. On that date, the operation of the supply chain will go through a huge change. All trading partners will need to have systems in place that allow them to accurately keep track of the serial numbers on every drug they ship and receive. Manufacturers and repackagers often break the DSCSA into a total of three phases rather than two. The extra phase they like to include begins on November 27, 2017 for manufacturers and 2018 for repackagers. Those are the dates when those types of companies must begin applying a unique serial number encoded in a Datamatrix 2-dimensional barcode along with the NDC, lot number and expiration date on each individual drug package and homogeneous case. This is known as “the DSCSA product identifier”. This will require a lot of effort by every manufacturer and repackager selling into the U.S. market, but I don’t include this as a major phase of the DSCSA because it only affects that one segment. I certainly understand why they consider it a major phase, however. Congress recognized the importance of the second phase and so they gave it a name. They called it the “Enhanced Drug Distribution Security” phase, or “EDDS”. During the EDDS phase, companies will need to keep track of the various events that each drug package and homogeneous case goes through in the supply chain. Some of these correspond to supply chain events that are familiar today—like shipping and receiving—but some will be new as the result of the addition of serialization itself. These include “commissioning” and “decommissioning”. Commissioning describes the moment a manufacturer or repackager associates a unique serial number with a physical drug package or case (although for reasons we will not go into here, it may actually be created at some moment later in time). Without the commissioning event, there would be no way to know the details about a given serialized NDC (sNDC), also known as a “Standardized Numeric Identifier” (SNI) (the combination of an NDC and the specific package or case serial number) (see “FDA Aligns with GS1 SGTIN For SNDC”). The serial number commissioning event can be thought of as the “birth certificate” of the physical drug package or case. Before the commissioning event exists within the EDDS, the package or case cannot legally exist in the supply chain. The commissioning event can only be created by the original DSCSA manufacturer or DSCSA repackager (see “Who Is A DSCSA Repackager?”), and for the EDDS to work properly, I believe that the commissioning event must be accessible to all trading partners that own the drug package or case that the event describes. We’ll eventually see what the FDA and the industry decide about that in the next six or seven years. But what about serial number decommissioning? 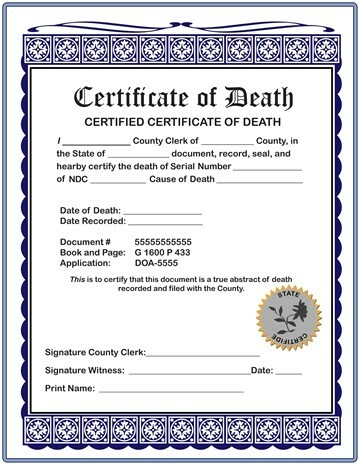 If the commissioning event can be viewed as the “birth certificate” of the serialized package or case, then the “decommissioning” event is the “death certificate” of the package or case. That is, the decommissioning event describes the end of association of the unique serial number with the specific physical package or case. The decommissioning event would be created at the moment that the homogeneous case is broken up into individual packages (if the serial number is associated with a homogeneous case) or when the package is fully emptied of its drug contents (if the serial number is associated with an individual package). This might occur at the time a serialized bottle of pills is emptied into an automated dispensing hopper, or when a pharmacist dispenses the last dose (or maybe the first dose) from a serialized supply chain package. It might also happen if the drug package or the case and all its contents are destroyed intentionally or unintentionally, or perhaps if it is stolen. For a more complete explanation of what decommissioning is and other events GS1 US proposes for documenting destruction and dispensing, refer to the GS1 Healthcare US DSCSA Guidance vs. 1.1 document published last October (see “The GS1 Healthcare US Guidance For DSCSA, Vsn 1.1”). Once a decommission event exists for a given sNDC/SNI, the associated package or case is considered non-existent (or more accurately “not traceable”…see the GS1 Healthcare US guidance) in the supply chain from that moment on. The serialized drug package or case must not be observed in the supply chain from that point forward. If it is observed, it would immediately be treated as “suspect product” (see “The FDA’s Draft Guidance on Suspect Product, and Farewell Columbus”). Like the commission event, for the decommission event to work, it must be accessible to all trading partners that could possibly be sold that product (or at least accessible to a “checking service” that would be used by companies in the supply chain, see “Should GS1 Continue Developing ePedigree Standards?”) and that event must be checked for before a patient is administered or dispensed each drug. The details of “how” are yet to be determined. It was pretty clear at the FDA’s DSCSA Workshop last May (see “The 2014 FDA DSCSA Workshop”) that the FDA knows exactly what “decommissioning” is and they believe it is of critical importance. The topic came up briefly during the time when several roving members of the FDA had stopped by to listen to the discussion at the table I was assigned to. We were discussing the EDDS at the time. Someone commented that pharmacies were known to not want to bother creating decommissioning events. One of the roving FDA representatives spoke right up and challenged that comment. She indicated that the decommissioning event would be very important to the operation of the EDDS. From my observation way back in the mid-2000s in GS1 US work groups, before the large chain pharmacies all at once stopped participating in such groups, representatives from those organizations always stopped the discussion of any solution that would require pharmacies to create and then share decommissioning events. At that time, they felt that it would require them to keep track of exactly which package serial number was used at the time of dispense and that would be unacceptable for several reasons. It would require the deployment of new software in every pharmacy to implement the necessary database updates and checks. As I recall, the chain pharmacies were opposed to just about any new action that would be required of them, even if the action only occurred when their drugs arrived at their back door instead of at the moment of dispense. But decommissioning would probably need to be triggered by dispensing rather than at receiving, and to maximize patient safety, the check for legitimate/suspect product should occur as close to the point of dispense as possible. In my view, the greatest gain in patient safety does not require these actions to occur at the moment of dispense as long as they occur at some point during the possession by the pharmacy. Will the FDA and the chain pharmacies agree with me? At least one chain pharmacy was a member of the Prescription Drug Security Alliance (PDSA) which played a major role in the development of parts of the DSCSA as it moved through Congress (see “Federal Pedigree: Caught In A Web Of Politics”). To get the legislation through Congress and eliminate the various State pedigree laws, every segment of the supply chain had to make some concessions. It is unclear what concessions the pharmacy segment believes they made to accomplish the goals of the PDSA and it is particularly unclear how likely they are to accept the creation/checking of decommissioning events at any point in their ownership of a drug. What do you think about decommissioning? Is it necessary in the EDDS phase? Is there an alternative that would be more palatable to the pharmacy segment and meet the goals of the EDDS mandate? Or do you think it is too early to discuss issues related to the EDDS? Leave a comment below. If the death certificate is issued at receiving at the pharmacy, IMO, that would be the good balance between patient safety and the viability of this plan. However, I say let the large distribution companies take on the responsibility, NOT the pharmacy. The package of medication was received at the pharmacy? have the distributor and their carriers keep those records as part of the supply chain. Again, NOT the pharmacy. To have the pharmacy issue a death certificate at the time of dispensing, even though simple in theory, is quite complicated. Each additional regulation placed upon pharmacy compounds the issues of receiving a medication in a timely manner. The end results of a poorly placed regulation hampers the effectiveness of the pharmacy to serve the patients. Instead of concentrating on visiting with the patient and doing correct counseling, the increased regulations forces the pharmacist to cut corners in order to fulfill requirements of the new regulations and dispensing the medication in a timely manner. Try working in a pharmacy where there are hundreds of prescriptions dispensed per day. Pharmacy is the number one regulated industry. Keeping track of every law, regulation, statute, etc is getting to me almost impossible for the pharmacist. Pharmacists are not lawyers. Let them be pharmacists and help patients. By large distribution companies, I presume you mean ABC, Cardinal, and McKesson. What though if there is an intermediary before the product reaches the pharmacy? It could also be shipped to a retail pharmacy distribution center as well. The pharmacy then takes custody, but what then would stop the pharmacy from sending that material, a bottle for instance, back to its own central distribution center or moving it to another pharmacy if there was need, or in a hospital setting, to another outlet even in the health system, that could be in the same building. I ask because I don’t typically operate at this level so I don’t know. I haven’t worked as a pharmacist, but I can understand the complexity, especially working with unit dosage and here, especially from a data management perspective. The wholesalers are already operating this capability and technology in places to help support processing the receipt and management, I expect they would be more than willing to provide the service of decommissioning, at a pharmacy level if so contracted. The last step in the process however, is where product could also be likely to be diverted or non-genuine product still could run the risk of being introduced, so I see this step as being just as critical, potentially more from a patient interaction standpoint, than any other. Thanks for your comment. The points you have raised with your questions are exactly why it is a bad idea for a wholesale distributor to preform the decommissioning step on behalf of their pharmacy clients, in most cases. On the other hand, if a pharmacy knows they will not engage in exchanges with other pharmacies, or returns, they could potentially contract with their supplier to perform the decommissioning step upon shipment of the drugs to that pharmacy. I’m not sure the FDA would consider that an acceptable time to perform the decommissioning, so this would be subject to their agreement in the future. Until the FDA provides guidance on decommissioning (if they even expect it) we won’t know what is acceptable.